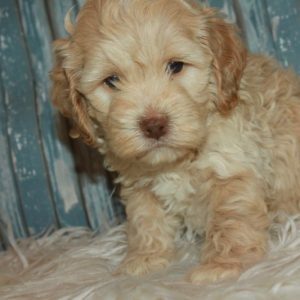 Buster is a gorgeous little 2nd generation Cockapoo! He has a rich chocolate non-shedding coat and blue eyes! He is very outgoing and playful-he loves people! I expect Buster to weigh 12-15 lbs when he is full grown. He is ready to go now. Dallas is reserved for Kristina! Dallas is a cute little Cockapoo! 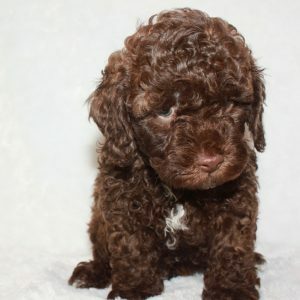 His mom is Cutie Pie, our chocolate and white Cocker Spaniel and his dad is Hudson, our cream Miniature Poodle. I expect Dallas to weigh 12-14 lbs when he is full grown. He will be ready to go around April 16. 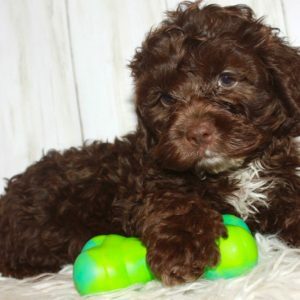 Dawson is a beautiful little Chocolate Cockapoo! His mom is Cutie Pie, our chocolate and white Cocker Spaniel and his dad is Hudson, our cream Miniature Poodle. I expect Dawson to weigh 12-14 lbs when he is full grown. He will be ready to go around April 16, he can be reserved now. Domini is reserved for Janie! 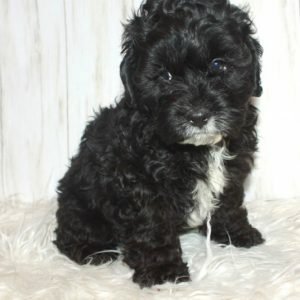 Domino is a sweet little black Cockapoo! 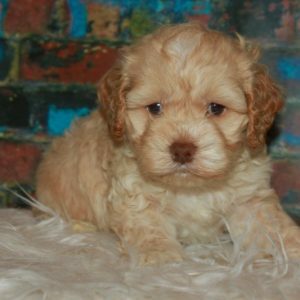 His mom is Cutie Pie, our chocolate and white Cocker Spaniel and his dad is Hudson, our cream Miniature Poodle. I expect Domino to weigh 12-14 lbs when he is full grown. He will be ready to go around April 16. Dunkin is reserved for Celeste! Dunkin is a precious little Cockapoo! His mom is Cutie Pie, our chocolate and white Cocker Spaniel and his dad is Hudson, our cream Miniature Poodle. I expect Dunkin to weigh 12-14 lbs when he is full grown. He will be ready to go around April 16.